Another meeting with local friends who agree to spread awareness about the Craigslist usage of advertising animals as "Free to good home" or for less than $100. 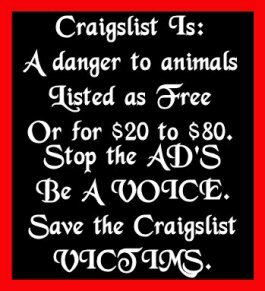 The issues we talked about in our meeting where those of people using craigslist as a main network to find their animals homes. There are other alternatives for this issue, such as Facebook, Myspace, public groups on google+. Even using wordpress and blogger would be a way better solution than craigslist. How many people remember Alex Phelps? Phelps murdered several cats he obtained off of craigslist. Jeffery Nally murdered 29 puppies and more. And now there is a David Matson who admits to killing 5-6 dogs he obtained off of craigslist. Craigslist rely's on people reporting posts that violate their terms of service, yet how many people really report correctly? 1. Never report dog fighting issue to craigslist always take snapshots along with jotting information down and report it to the Anti Dog fighting campaign, along with the authorities plus the Humane society. 2. When finding a post for FREE TO GOOD HOME, contact that person who is posting and have a civil and polite conversation with them, informing them of the downside of using Craigslist. 3. What you should report to Craigslist is spam IE. Harassment, bullying, bots and scams OR Libel and Civil statements. Reporting Animals for sale apparently does nothing as you can see from the reports. They still become either Victims or Obtained by honest people who care for them. Yet the chances of them going into a loving home from craigslist is SLIM to NONE. There is a petition out there for those to sign to stop the sale and free to good home posts. If you support this idea please feel free to sign and share. Please sign this petition to halt the PAID leave of David Matson until his trial in November!